Thinking About Surgery for Ankle Arthritis? "I Had The New Ankle Arthritis Surgery and Loved It"
It wasn’t long before Castle was unable to walk or stand for long periods of time. She wondered if she had, in fact, broken her ankle, rather than sprained it. A few months later, she had an x-ray taken at the Royal National Orthopaedic Hospital in London, which revealed bone rubbing on bone with severe cartilage damage sustained. In an attempt to stabilize the ankle, her body had formed bony spurs along the edges of the joint, but these same “stabilizers” were also the source of her excruciating pain. The doctor surmised that it wasn’t just the trip over the curb, but also the aggravation of a hit-and-run accident she had sustained 35 years ago that put her in a plaster cast with a fractured shinbone for six weeks. Researchers have found that about 15 percent of patients with osteoarthritis have the condition as the result of a traumatic injury. It is believed that sudden, forceful impact (whether a fracture occurs or not) shuts down the production of cartilage-maintaining compounds. “In the early stages of osteoarthritis, chondrocytes overproduce BMP-2 and the other compounds they need in an effort to maintain the cartilage,” explains Dr. Joseph Borrelli Jr., MD from the University of Texas Southwestern Medical Center.2http://www.aaos.org/news/aaosnow/may09/research4.asp “When the chondrocytes burn out, the cartilage starts to wear away.” This process can take as little as six months or as long as 20 years. Unfortunately, understanding the mechanisms behind arthritis development does not necessarily prevent it. While you may be able to slow the progression through physiotherapy exercise and maintaining a healthy body weight, there is no guarantee. More often than not, cartilage simply wears away and the body cannot rebuild it. Injection therapy is a promising avenue for treatment that may be able to reinvigorate the area with the necessary growth factors to trigger collagen production again, but it is still considered “experimental” and is not covered by insurance providers. So what is a patient like Donna Castle to do? With the traditional ankle fusion surgery, screws fix the upper and lower parts of the rubbing, aggravated joint together permanently. The good news is that there will be no more stabbing pains or grinding. The bad news is that the joint can no longer complete a full range of motion, which can be frustrating for active recipients. Worse yet, a fusion inevitably ends up placing additional stress on other foot joints, causing arthritis elsewhere down the road — usually in about 10 years. 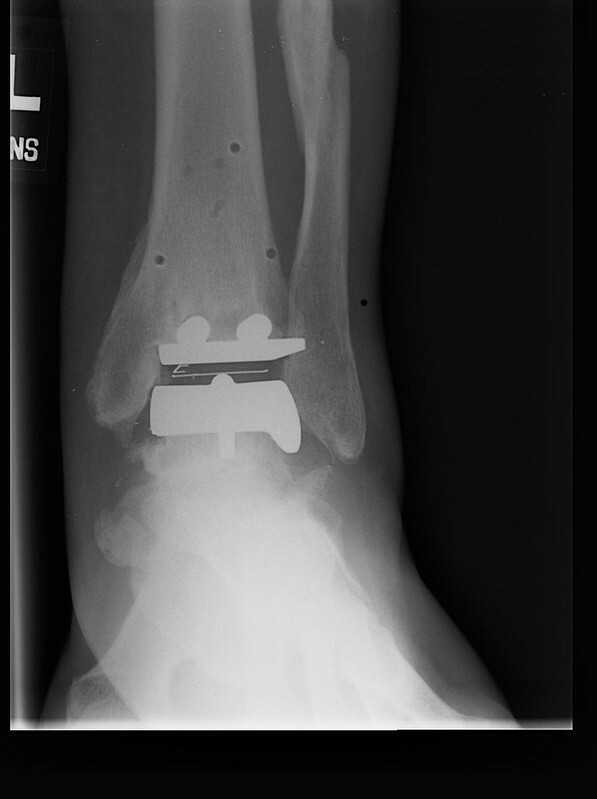 Instead, Castle’s surgeon recommended ankle joint replacement surgery using a new computer-assisted technique for more accurate positioning and longevity.3http://www.totalankleinstitute.com/prophecy-preoperative-navigation-guides.html A robust plastic artificial joint would be sandwiched between two metal plates to allow the joint to glide naturally along a smooth surface. It’s still a fairly new type of replacement in Britain, with only 600 of such surgeries taking place each year. So, in December 2014, Donna went in for a CT scan so the guides for her surgery could be made. Her February surgery took 90 minutes under general anesthesia. The surgeon made a 15 cm cut at the front of the ankle to expose the joint. He used a metal pin to fix the 3D guides to the ends of the upper and lower ankles. Cuts were then made in the bone (to the guide’s precise specifications) and a dummy implant was inserted to test for mobility and stability of the joint. The permanent implant was placed next, the guides removed and the wound stitched up. After the surgery, Donna received injected pain relief medication and stayed in the hospital for five days. At home, she continued taking co-codamol for pain relief over the next two weeks and wore a plaster cast for a month, which was followed by a cushioned walking boot for six weeks. All told, she was on crutches for 2.5 months. Prior to using the new technique, it could take patients up to a year to walk pain-free. Now, most patients are pain-free by six weeks and walking without a limp by three months. Are There Any Disadvantages to New Ankle Replacements? Currently, there is still room for improvement, many surgeons believe. The 10-year failure rate is estimated to be about 12%, which sounds very low–but is actually double that of hip and knee replacements. One problem is that ankle replacements are not specifically tailored to the individual, although they do come in a variety of dimensions and sizes. The success also depends upon the surgeon’s judgment in the positioning of the implant. Just a few millimeters off and the implant can catch on body tissue, causing pain or excessive wear. That is all changing, though, with the use of systems like PROPHECY, which use custom 3D printed bone modeling and guides to show surgeons precisely where incisions should be made in the bone and implants are to be attached. The only downside, then, is the lack of long-term research in determining the full impact of the increased accuracy. It is still unknown whether computer-assisted placement reduces the risk of loosening and excessive force over time. For more information on total ankle replacements in NY and the most advanced ankle treatment techniques, contact The Center for Podiatric Care and Sports Medicine.